I've wanted to do a collage dedicated to France's First World War experience for a long time now. On my original 1914-18 collage, the starting point was the ordinary Tommy. I deliberately chose at random, from a selection of WW1 postcards in an antiques shop, a portrait of a soldier to represent the Unknown Warrior. I was really keen to do this for the French collage as well, again at random. And whilst visiting a brocante fair in Auvergne I managed to find a tiny Carte de Visite card, in amongst a huge stall, with a picture of a French soldier. 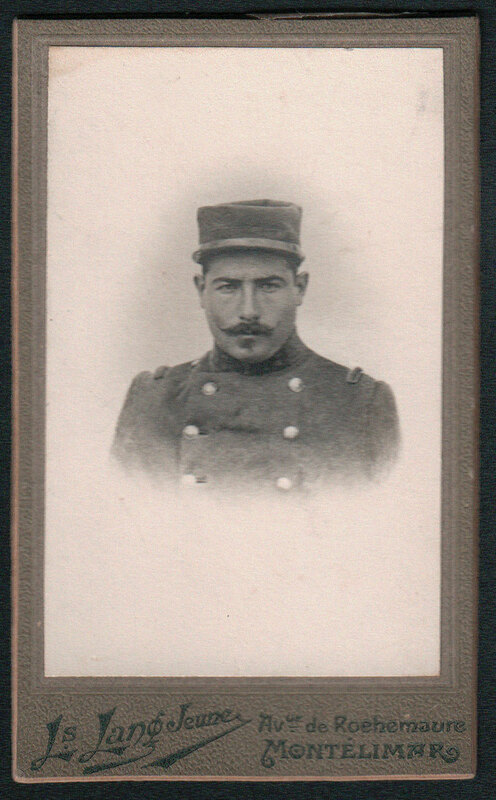 An anonymous face from the past to represent the ordinary Poilu. 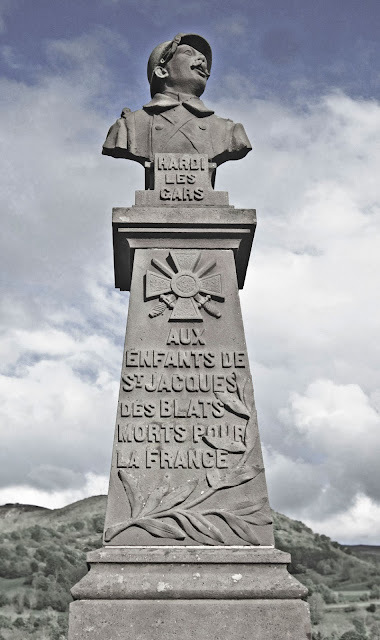 France's relationship and memory of the First World War is much different to our own. To us it was mostly an overseas war, but to the French it was a direct attack on their own homeland. We have the Somme and Passchendaele, while they have the crushingly senseless slaughter of Verdun as their focus of remembrance. As such their memorials have a subtle difference to our own. Having been to France many times I've studied them and noticed they can be dramatic with figures in exaggerated poses with a defiant air about them. A sense of victory sometimes seems to be the focus. Ours are often sombre and reflective. 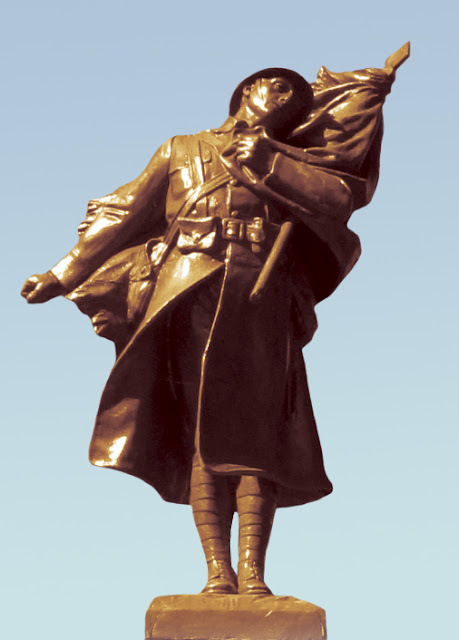 The defiant pose of a soldier's head on the memorial at St Jacques des Blats, with the wording 'Hardi les Gars', which has the rough translation of 'Take courage and go forward lads'. Again, an exaggerated pose on this memorial at the village of Job. I'll be rooting around the ArtPix Archives for all the items of French World War I memorabilia I've got, including medals, postcards, books and many, many photographs. 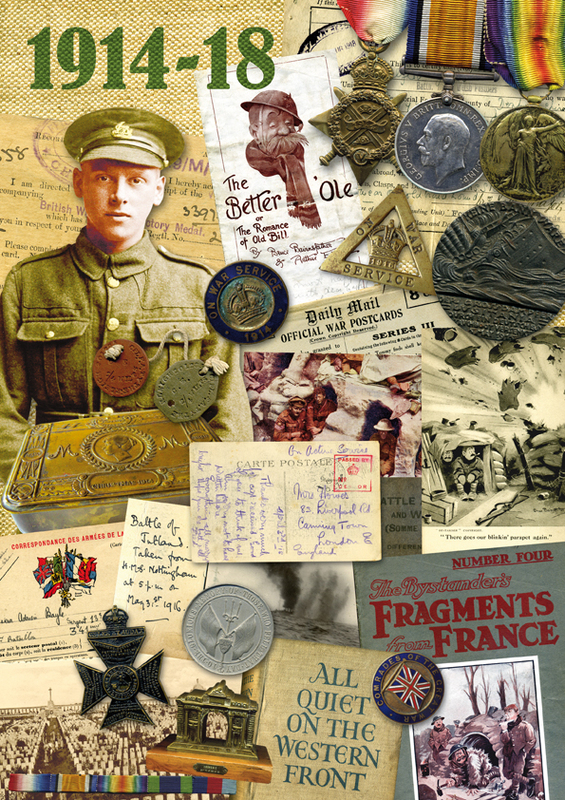 My original First World War collage. IS IT ALL BLACK + WHITE?